The Tenderloin, already purring with swanky bar and restaurant openings, will receive another place to carouse this summer in Black Cat, a restaurant and lounge with a touch of jazz. The bill at the Black Cat is already promising: Ryan Cantwell of Zuni Cafe and Chez Panisse is handling food, Gabriel Lowe of Locanda and Beretta is on top of drinks, and Jardiere's Eugenio Jardim has a 90-bottle wine list in store. Designing the two-story space at Eddy and Leavenworth is Craige Walters, who did Blackbird and Hecho. The lounge will feature a stage, where cabaret performances will be booked by Emma Henley, a burlesque and variety show impresario. Jazz is to be selected by Theo Croker, a local trumpeter and composer. When that's empty, an art-house video installation by Sarah Feeley, whose work includes Tim Burton's Corpse Bride, will keep patrons entertained. "Some of the greatest restaurant venues in the city emerged from its dark and forbidden corners," founding partner Fritz Quattlebaum says (some will hiss at that), invoking "Stars. Zuni. Mecca. Foreign Cinema. These iconic places materialized from parts of the city that were out of favor, had been forgotten, or avoided. They brought light to these desolate corridors, and people from every neighborhood flocked to them." Coincidentally, the Black Cat Bar, a North Beach gay and bohemian haunt of yesteryear, was recently recreated for the filming of a new historical series When We Rise. We've reached out to the team to find out whether the homage was intentional, and will update you when we hear back. Update: The team says they are "taking the name to pay homage to the original Black Cat." 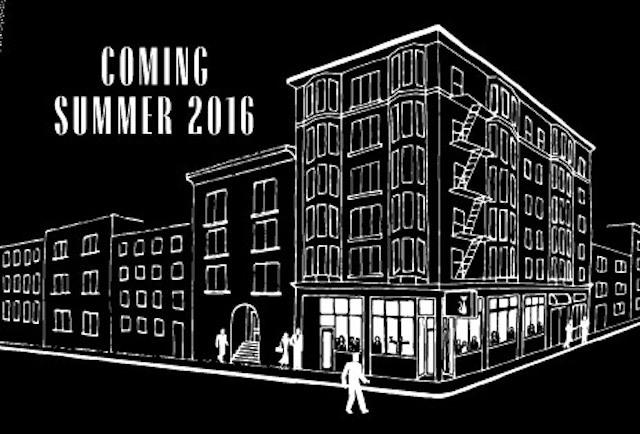 Black Cat - 400 Eddy Street at Leavenworth Street, opening sometime this summer with nightly hours until 1 a.m.